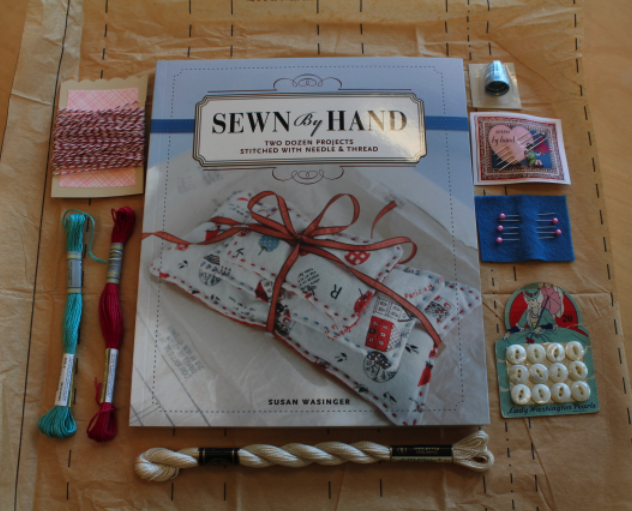 Susan Wasinger's new book Sewn by Hand: Two Dozen Projects Stitched with Needle & Thread offers 'two dozen' (or '24' to the rest of us) projects to hand sew. Not just at home but to take along with you and work on wherever and whenever you like. The book is aimed at sewers of all skill levels. There are quite some fairly easy-to-do projects (napkins, bibs, thermal packs) that can be made with little or no experience. And some are more challenging like the Hassock. If you are not familiar with hand stitching you will find lots of information about materials, tools, knots and stitches in the first chapters. Do you sew by hand? Not counting embroidery, I rarely do. Maybe a tiny bit of hand sewing when I have to close gaps on soft toys and pin cushions. Or the occasional button on a coat... And for any other sewing project I get my sewing machine out. So the idea of sewing bikinis, aprons and hats 'unplugged' was kind of new to me! The portability factor is indicated with each project and varies a lot. Obviously most people will be unlikely to tag along some huge curtains to a cafe but the cute thermal packs could be sewn up quite easily when you are on the go. In previous work Susan Wasinger has been keen to recycle and re purpose stuff so it's no surprise that Sewn by Hand has a couple of projects where recycled materials are being used. There is a nice project (see photo above) using old men's shirts (that is not shirts from old men but...oh you know what I mean!) to make an apron. Personally I would be very much inclined to get my iron out to make neat seams and run the panels quickly through my sewing machine. Maybe because I already spend much time on other 'slow crafts' like embroidery and quilting... In other projects, the hand sewing is part of the charm or decoration of the items made. Many of the projects, and indeed the whole layout of the book, have a nostalgic, timeless feel to it which fits the 'strictly Hand sewn' theme perfectly. The nice folks at Lark Crafts have been so kind to provide us with some neat goodies to give away. Yay! Not just the book Sewn by Hand by Susan Wasinger but also the fun haberdashery that's pictured on the photo above. To have a chance to win, leave a comment on this post and tell us if you get your needle and thread out in public (and if so where! ).I will close the comments this Thursday and announce the winner the next day. ed. comments are now closed, winner will be announced later today! If you can't wait to try out some hand sewing yourself you can find a project from the book here. The Sewn by Hand blog tour will continue on the following blogs! No, I am a bit of a closet stitcher! Thanks for the giveaway! Wow! I started off making clothes and things hand sewing, and even though I now have a sewing machine, there are times I'll choose to hand sew it rather than machine it. Ooo I love when the weather is like this to take my sewing(and a flask of coffee)and sit on the park. By the river and with the birds there it's amazing and I stay for hours! p.s. Those patterns are to die for! Years and I mean years ago I made a wrap skirt by hand. It came out great and wore it for years now only felt objects but I still enjoy hand sewing maybe that's why I enjoy embroidery so much. Very calming! I do take my embroidery (mostly cross stitch) when traveling. It's fairly easy on planes (apart from the no scissors angle, love my threadcutters) and on long distance trains. Mostly small projects, and precut thread. I used to take larger projects and sit in a park, or by the river on a sunny day, very soothing. People are fascinated by the fact that someone makes this stuff- I never run into fellow crafters! Love the look of this book - thanks for the preview! I don't hand sew right now but I would love to try it. i am always looking for projects that I can take with me. With small kids it is hard to spend a lot of time behind the sewing machine. I starting hand sewing when I wanted to learn to make hexagons for a quilt - I would bring it with me to my job - work at a college - and during downtime I would sew. Gives me a mental break as I am an interpreter for the deaf. Sometimes it's hard for me to appreciate the process of something because I want it to be finished quickly, but handsewing is something I really enjoy. Most of my sewing features a few handsewn details. I am the House Manager for a local theatre, and part of my job is just sitting in the lobby during the show in case patrons need assistance. I get a lot of hand sewing done--I recently finished my daughter's Easter dress with a handsewn hem and bound buttonholes. Thank you for the opportunity for this giveaway. I frequently Stitch In Public...usually needlepoint or tatting, but occasionally cross stitch. i sure do! I have stitched at work on lunch, at the doctor's office, in the car (while hubby drives) and where ever I know I will be sitting doing nothing. It keeps it out of trouble. I hand sew in the car on trips, and at my mother-in-law's house when we're visiting. But that's about it! I have been known to take my embroidery out in public (lunch time at work, doctor's waiting room), but I haven't taken my sewing out of the house. Maybe this book would allow that to change? I'm such a home-body there are any real opportunities to sew in public. I do try to keep some beading or stitching magazines in the vehicle for those delays that are unexpected! Last year I hand sewed a doll for each of my daughters. I brought the pieces everywhere since they were so small. Gotta make a least 2 of those bikinis...Hopefully I'll win, Keep creating! I rarely take my sewing along with me but I do embroider a great deal. I have been hand sewing some doll clothes recently. Great book and lovely giveaway package! This book looks so inspiring! I bring hand stitching in a basket with me almost any time I leave the house. Doctor appointments, picking my son up at school. I always let my husband drive when we go out and my son sits up front so I can peacefully stitch in the back with all the space. Regardless of what I am making, the process is comforting and quiet. I don't ever hand sew beyond a binding or to whip something shut! I'd love to flex some new skills!! When it comes to hand work, I'm almost 100% quilt and embroidery. But I did enjoy hand sewing a couple of spool birds this past Christmas. Hand sewing projects are great for long car rides. Oh, trains, well when i travel by train and at cafés with my Mom, outdoors in parks sometimes. I've done sewing in lecture halls during my studies. Nothing like it to keep your focus up! I don't get my needle out in public very often unless you count the car when we were are traveling. Thanks for the opportunity to enter your giveaway. I embroider all the time in public, so sewing would be a cool thing to do out in the world. I'm in the middle of hand sewing a log cabin quilt. That means I get to take the pieces with me wherever I go... even to the barn for in between chores! I like crocheting and embroidering whem I am on the go, buses, cafe shop wherever and whemever I have a time. It feels so good to achive somenthing out of the ordinary! I haven't sewn in public, but I knit in public everywhere! Mostly at my weekly meet-up at a local Starbucks. I do my handstitching (or knitting or quilting) anywhere I can - friends' houses, meetings, doctors' waiting rooms, whatever! Anywhere there is enough light and stays still enough to do my handicrafts. hello!!! i love all sewing needles an stich!i haven' t problem to take my my needles or stich and do this when waiting or travelling. two moments i remmember is in the ship and train when i wait and take my needles and make a pullover and another time when i was going at football game and i feel boring i do the same. people look me like crazy but this is not problem for me. is the same take your nedles and read a book. sorry for my english is not very good! I do some hand sewing when finishing some of my needlework projects, but not a ton of it. I have to admit that I just got a brand new sewing maching and I'm rather enjoying playing with it! As for where I stitch - I'll stitch just about anywhere that there is light. I stitch when my husband is driving us somewhere, I stitch in the mall while waiting for the rest of the family to finish their errands, I stitch while my son is having his swimming lesson, I even stitch at lunch time - basically, if there's a second free, I've got my needle and fabric in hand! I take my stitching with me everywhere. My daughter has dance classes three days a week, for several hours at a time, and the studio is an hour away from home. I take my crossstitch or embroidery with me so that I stay busy. The girls at the studio know that I sew and I am often asked to sew the ribbons on their pointe shoes when they tear. I have also taught a few interested girls how to stitch in between their classes. I keep extra fabric and thread in my bag now, just in case. Thanks for offering the giveaway! I rarely get out a needle and thread for sewing in public, but I've done embroidery at work sitting at my desk before. Most of my sewing is done on the machine too - it might be a nice refreshing change to make some hand-sewn items. i would really love to win this book because i have been wanting to do more sewing by hand. there are a lot of things that I do do by hand (like spinning yarn, crocheting, etc...) and sewing is the next to be added into my traveling bag of crafts. this book looks like it would be an excellent inspiration in helping me get sewing by hand into my regime! My sorority sisters and I would have letter sewing afternoons out on the quad or hat making parties for the "Invisible Children" fundraisers on campus. I embroider my dad handkerchief's every year for his birthday and father's day, and I will stitch on those wherever I am! This year I'm going to do some fun stuff instead of his initials...I'm thinking bicycles and canoes! Thanks for the giveaway, looks like a great book. I usually do my stitching at home--don't usually do it in public. I love handsewing as I don't have a sewing machine.I would love a chance to win the book. I only do cross stitch in public if my garden counts as a public place since the neighbours can see me!AriadnefromGreece! While riding the train to work in San Francisco, I hand pieced an entire queen-sized quilt. I mostly do embroidery work or crocheting and knitting in public. I leave most of the other hand sewing to the evenings while watching my favorite shows. I always have hand sewing with me when I'm headed to appointments, meetings, and even vacations. I love stitching in public. I have problems being around people, but if I'm doing something with my hands I tend to be less nervous. Better to be doing something productive and creative than to just be messing about with my phone! I sew on long train journeys -- such a peaceful (pieceful, hah) thing to do as I look out the window. I sometimes sew on the train, even beading, which is not that practical though. The lining of my coat started to come undone after an incident where I fell in the redwood forest, and the only thread I had was bright magenta embroidery floss (on a black coat), so hand stitched it together with that. I like it a lot now! The book looks lovely! Thanks for the opportunity. Usually you can find me embroidering (or sketching ideas for this sort of thing) at Starbucks. I LOVE hand sewing, but that happens at home. This looks like such a lovely book! Thanks for the chance! I am the Queen of the Handsewn. The machine runs too fast for me to get everything straight--It freaks me out! But I have started to learn. And yes--I sew virtually anywhere and everywhere--my Daily Stitch is on the bus on the way to work. It took awhile to perfect, but there are no pricked fingers here, and I have a whole travel system for the project I am working on. It actually gets people interested in what you do. I don't sew in public, but I'm going to start taking it on my commute. It will be more productive than doing the crossword puzzle! Thank you for the giveaway! I don't think I've ever really sewn in public. I guess I just don't want my project to get dirty or messed up. The idea of sewing by hand is less intimidating to me than sewing by machine. Is that bad? I am so scared of my sewing machine!! By hand is pretty much the only way I sew! I don't hand sew in public, but I do crochet on the light rail when I am commuting to and from work. I hand sew just as you do...finishing small projects or mending. I attended a workshop last fall where we stitched items together totally by hand and it was a challenge! I tend to read in public more than sew! I would love to win the book. I take my embroidery(or my knitting!) along to potluck dinners with friends, and on the bus, or when I'm needing to get to an event(or work) 30 minutes or more early, and work on it. With the embroidery, its funny how often you hear, "You mean people still do that?" Or maybye, Sad. oh please include me! I love stitching by hand and would love to try out some of the ideas in the book! I mostly sew on the subway - it's a great way to spend a 40 minute trip. But with summer coming I'm looking forward to days in the park and on the beach. With a small sewing project with me of course! Thanks for the chance to win. I do my hand stitching everywhere I can; at the pool while waiting for my kids swim practice, or at the doctor's office while waiting for them to get check up. I have 3 kids and they all very busy, I have to keep them busy especially my boys otherwise they will drive me crazy. Another book I want!? when will it stop? tee hee ~ this book looks great, thanks for the chance to win it! I love to sew in public! I'll do it in cafes, bars, bookstores, parks, and even on the bus (tricky tricky) all over San Francisco. Pick me pick me! Fantastic giveaway. I would tend to embroider in public as it seems more portable but I'm trying to improve my clothes making ability so this book would be ideal! I sew, knit and crochet in public all the time! I take projects on the train for my morning commute, and sometimes take a project along for down time during the day. I have knit in public, but I have not handsewn in public. The thought of taking a sewing basket to a park or cafe, sounds delightful. I haven't done too much hand sewing, but I'd love to learn more about it. I do stitch in public, I quite enjoy blending something which is usually so solitary into something more social and interactive. I like to stitch at baseball games, especially, because it's a relaxing atmosphere and you stay in one place for hours :o) Good times! The only handsewing I do is embroidery, cross stitch, and felt toys. I take my project bag everywhere with me, and sew in class, on the bus, in the coffee shop... everywhere! i love hand sewing but have gotten used to the speed and ease of my sewing machine projects. But i still hand sew little odds and ends and I have to finish some machine projects by hand. I like to pull out my projects when traveling by car, train, or plane. It makes the travel time go by super fast. I'm kind of closet sewing -'cause I'm a beginner- but sometimes I sew on the bus while I'm traveling to work. ^.^ And sometimes I have good luck and some other sewing madams give me advices and help me with some parts. Thanks for the giveaway!! yay!! I think I've only sewn in public once - I sewed a button onto my work uniform shirt on the top deck of a bus. It was an interesting experience, probably the messiest button I've ever sewn on and it resulted in me stabbing my fingertips with the needle an uncomfortable number of times as the bus swerved round corners and went over speed bumps! Now that the weather's getting warmer I'm definitely going to take my sewing outside more, perhaps for a nice sunny afternoon in the park with friends. so far I've only done so to mend a tear in clothing. but i wouldn't be averse to sewing in public! I've knitted on public transportation, at cafes, and in movies. I have never tried to sew in public. I have enough trouble keeping track of my needles at home. So my first project would have to be a sewing kit/needle book. The most frequent place I stitch other than home is...staff meetings at work. I have taken small projects to music festivals too. I'm not doing that much right now while my son is an energetic toddler, but would love to get back to it! I sew in and between my classes at the U of M. I like the funny looks I get,because it means I'm making people think, and absolutely love the cool people I meet who are brave enough to ask about what I'm doing! I have little projects in every room of my house, and a special little one in my bag, as a pincushion or a little bag. Crafts with needles are addictive! Aside from closing up gaps in dolls and stuffies I do hand bind all of my quilts! That is a tedious, but totally rewarding sort of hand stitching. I like to take my quilts to our local art center and sit in the gallery and hand stitch away! I HAVE STITCHED IN ALMOST EVERY PUBLIC PLACE KNOWN! WE 'STITCHERS' ARE EVERYWHERE! THANKS SO FOR SHARING! I am currently hand sewing a skirt. I don't sew in public but I do a lot of knitting in public. Yes - I sew in public! I'm a docent at an historic site and demonstrate hand sewing to show people that it can be done without machines! People find it fascinating. I love to hand sew...I bring it with me on Bart, on the Bus, and sew on my lunch breaks at work. I even did some at my mom's house on Easter!! For me, it's more like where I do NOT take my stitching with me! I feel disconnected from my life source without a needle and thread of some fashion in my hand, whether it's cotton, silk, rayon, poly or a blend of thread, yarn, or embroidery floss, silk ribbon...and the list goes on, accompanied by knitting, crochet, and/or quilting, fine sewing, or embroidery needles. I make sure that I am NEVER without a portable project because I'm never complete unless I'm stitching. My work has been spotted in restaurants, doctor's offices, car repair centers, Wal-Mart, churches, and even on the side of the road while waiting for a tow truck. My needlework is my heartbeat, my purpose, and quite possibly my given name! I definitely would if I didn't have to lug my sewing machine out! I run a craft group and have had to push my sewing love aside in favor of more portable crafts for most of our meetings. I never thought of just trying to hand sew my projects because well, my hand sewing is pretty terrible. But I've never been taught on anything other than a machine. I'd love to learn and I'd definitely start sewing at our craft meetings! I mostly do my crafts ( including sewing) in public. During lunch in the staff room, on the bus, even waiting at a doctor's office. I've just started doing a teeny bit of hand sewing. I'd love to learn more because it would certainly be more portable than my sewing machine :o) !!! I have a couple long driving trips planned for this summer...it would be great to take along some hand stitching! I just recently started a new embroidery sampler that I take to work! I drive a city bus and every chance I get I pull out my sampler and take a few stitches! I have a lot of timed points throughout my route, so I've completed a pretty good chunk of designs in a matter of a few days! Thank you for adding me to your drawing! Absolutely... I stitch in public! I did the March stitch along mostly on the go. I took it to the dentist and a Dr. visit. People are quite curious when they see me stitching and ask questions like "are you knitting???" haha. I haven't done to much hand sewing other than a couple of pillows. But I do a lot of my embroidery (still learning) in public; it is so relaxing. I bring hand sewing or knitting every time I leave the house...it makes a waiting period not only tolerable, but actually enjoyable! I love to embroider at the beach, which is always so much fun. I love hand sewing!! It was the only way until I bought a little sewing machine a while ago. But I still do a lot of hand stitching. I have been thinking of taking a little hand sewn project down to the beach instead of taking a book, but haven't got that far yet. I really want to make that bikini!! I've never hand sewn in public, but I've never had a project that was portable enough. Now, when it comes to embroidery, I'll stitch almost anywhere, the doctor's office, the park, the beach. If I have time and a place to park my behind I'm good to go. i stitch, knit, and crochet in public all the time. i always have at least a few project go bags stocked and ready to take with me. i take mine along to the park, mcdonalds playland, library, and any type of car ride. my boy can play for hours, and i get a lot accomplished. since learning to craft i have never been stuck getting my oil changed and having to look at their awful magazines. usually i like to draw while i listen to things, the other week i took my sowing to church and as i listened to the sermon i stitched away. it was really fun and only got a few weird looks. I stitch everywhere. School meetings, in the car (waiting), church, sport practice...scrapbook night, at the library.....stitch away! I love stitching in public. The best is sitting outside a cafe on a nice day with some iced coffee and a sewing project. I sewed up a little finger puppet on the train a while ago... and really enjoyed all the curious glances! I really should do it more often! I've done hand sewing in the break room at work. I've done it in the first class section on an airplane. I've done it in the car. I'm not a closet stitcher, although I do like stitching while sitting on my couch. Not in public...in small gatherings of friends, though I do bring out the stitchery. I hand sew at home, but I knit and or crochet just about everywhere. Thank for a great giveaway! I do embroidery in public a lot, but not as much hand sewing. I have been working on the same hex quilt top off and on for over a year now and lately it goes everywhere with me, tucked into a little plastic shoebox for portability. The most visible place I have sewn was in the hospital waiting room, watching my friend's son while she got her wrist x-rayed and casted. There were two little girls there with their grandmother and they were absolutely fascinated with what I was doing, but were too shy to ask anything so I explained about sewing and making quilts and their grandmother chimed in about making quilts when she was younger. It was a pretty cool experience to be having that kind of conversation with people I wouldn't have spoken to otherwise. I don't sew in public (too scared I'll lose the needle, I think), but I do knit and crochet at our summer concerts in the park, or at the playground with my kids! I love to sew but most of my projects don't travel, but if they did I would take them along! Great Book! The only place I embroider in public is at school. I'm always torn between schoolwork and stitching during the semester, and this way I don't have to feel as bad. My professors don't mind it at all. My favorite place to stitch is at my grandma's house when the whole family is over for the holidays. We all sit around talking for hours and I like to keep my hands busy. I also bring projects along on road trips, I can get so much done in the car. I guess neither of those are really that public, but it's as far from home as I have gotten. I don't do much hand sewing. However, sometimes it is more convient and I'd love to have some projects. I sew when I'm traveling and when I'm camping! Hand sewing is one of my true passions! I long ago set aside my sewing machine, when I started quilting. I loved it! And I quickly learned to sew an arrow-straight line with no guide. My grandmother taught me to thread a needle and make a knot at the very end of a thread, and I really haven't looked back. Well, sometimes I look longingly at my friend's quilts that she makes in a week or two machine-sewing, but I really like the fact that I can get down and dirty with some hand sewing wherever I am. It's much more portable than my old Singer. And such a great skill, wherever you are. Just recently, I helped someone at work who split her pants (ha! ), sewed a couple of buttons back on a jacket, made curtains for my kitchen, and made a little felt costume for a Red Riding Hood doll. I'd really like to do more embroidery as well. There's nothing like the feeling of a needle in your hand. I do! Waiting for my granddaughter during ballet class is the perfect hour long lice of time to stitch a felt pin or hand quilt a pillow. I love having a bit of something to stitch when I am traveling. Most of my hand stitching comes from mending or hemming - I think something handsewn (NOT the bikini) would be nice! The most public sewing is when I have sewn a missing button on pants. I am a kip knitter. I did embroider one time in public at an exhibition of some sort. I was drawn to the embroidery table and people kept coming by asking what we were doing. I was happy I still remembered how to french knot! My embroidery is pretty much the only thing I sew in public, since it's all pretty contained. I make little plushies by hand on occasion, and the parts are usually too small to take with me when I go out. I don't sew in public places, it will be troublesome and I can't concentrate. It's better if i'm at my sewing room. I sew by hand all the time! I generally take my current project, or part of it, to my stepdad's place so I can sew while everyone's chatting - if I don't have anything to work on I just get all crazy and fidgetty but I've finished loads of things almost without noticing while we've been running our mouths! The last one was a massive plushy squid that had to be transported in bits - now it's nearly finished so it's a bit large to be taken out of the house, so the current project is a cross stitch picture. I like to take my mending with me when we go camping, perfect sitting camp work! I like to take my mending camping, perfecr sitting around camp work! Most of my sewing is done at home. I am usually chasing my kids in public! Hm, no, I've never sewn in public, but that's probably because I usually take knitting along instead! Well not really in public. I helped my grandma fix that hole in her sleeve though. I sew everywhere. I am never without something to sew, drs office, carpool, work - I even sneak in stitching there. I am totally addicted. I sew during my lunch break at work and sometimes at Dr. appointments (if I don't have a toddler with me :)). I love embroidery and quilting, very therapeutic! I would love to win - I travel and need a great project for my trips. Thanks for the giveaway! No but there's been a few times sitting in a Dr.'s office that I wished I had. Yes, I will do my hand-sewing in public. I enjoy sewing "hexie" flowers and have a little carry bag to take my sewing with me. I usually get a LOT done in the doctor's waiting room. I don't sew in public because I don't do many portable projects. Usually I hand-sew hems on jeans and occasionally I will take in the sides of too large shirts that I need room in the bust for, but not the waist. Knit and sew in public but, and I'm not complaining, usually only get about three stitches in before winding up in a really great conversation with an experienced sewest. No matter, makes me happy to have needle in hand and that people want to talk about sewing. I carry some hand sewing around with me most of the time. Lately it's folded pinwheels. I bring it to the hospital when my husband or mother-in-law are in. I load up a leather file box with fabric and embroidery floss. This not only keeps me sane but my family (the patient)knows I am there but they don't feel the need to entertaine me. Some times the item I am making is used for thank you gifts from us to staffers. I do hand sewing in the car (not when I'm driving - when I'm a passenger)and at friends' homes. I tend to be more shy about publicly embroidering...maybe because it's not usually something that I can mindlessly stitch or easily speak without looking away from my project...what a lovely book! Hi there! I enjoy your blog! I get my thread and needle out whenever I can. In the car, in the park, on lunch. You name it! Thanks for sharing your give=away! I hand sew a lot. My sewing machine is kind of intimidating at times. When I worked in a coffee shop I would sew/stitch in public all the time. It's very relaxing, except for the occasional onlooker who then asks maybe a few too many questions. I don't sew in pulblic as I rarely have time to sit still! I'm quite liberal with my sewing, embroidery and crochet projects and I often take them out in public, unless they are too big to go out of the house. I'm doing a PhD so I have tons of lectures, conferences and talks to attend so I try to have a small project next to me all the time, it is also very good for public transport hours! I do craft work in public, but it's mostly knit and crochet because I don't hand sew much. My favorite places to do my crafting is at school functions and music rehearsals. I am really intrigued by the idea of doing more hand stitching. I'd love to have the skill! I do like to take appliqué projects on vacation. Like a previous poster, I usually have to shorten all my clothes (I'm only 4'9 1/2"). It's so much neater. Before the ban on sharp objects on aeroplanes, I also used to sew there. A long boring journey was soon over. I don't have a sewing machine, so I'd love to have this book! I don't sew in public (yet) but I do cross stitch and embroider in public. Jury duty was especially productive! I take my baby quilts and sew the binding wherever I go -- dr's offices, car trips, friends' homes! I don't sew by hand in public so much anymore. My grandmother taught me handwork beginning when I was 8. My momma loved to sew but did NOT look forward to the handwork, so usually we worked together, she machine sewing and me doing the handwork. I loved those days. Momma has been gone for 16 years, and I still think of her everytime I work on something by hand. Thanks! I sew everywhere..soccer practice, doctor's, dentist, waiting in the car if I am not sewing I am knitting. I am shameless about crafting in public! That book is on my wish list! Thanks for the chance. I take my needle and thread along when I am waiting for family in the doctor's office. Taking 4 kids to the doctors, dentists and orthodontists make for a lot of waiting. I don't sew in public but I do all of my felt projects by hand. I would love to try other larger things like the projects in this book. I might even be able to save a sewing machine or two if I got good enough at hand sewing. I think my sewing machine is afraid of me lol. I love hand stitching and always have one or two projects with me in case the time is right for a little sewing. I like embroidery, cross stitch, knitting and just general hand sewing, whether putting blocks together, quilting, mending or whatever. Thanks for a chance to win. I love to stitch by hand! I like taking a project out into town in public since I don't own a machine. Book stores, coffee shops and parks are my favorite places to sew. Sewing via airplane is easy, while car trips can be tricky. This boo is just what I need for new projects and inspiration. On road trips, my parents, & my in-laws, but it's mostly putting finishing touches on an appliqué. Would love to make something entirely by hand! I've been wanting to find a good resource for handsewing, and this book looks perfect. I love the apron project! I'm going to be moving further from work soon and am looking forward to taking the bus and being able to stitch during my commute. --Nikki E.
I've not sipped, but have hand-sewn felt food for presents. The book looks terrific, thanks for the chance to win it. Yes, I do sew in public! The latest time was on the ferry back to the mainland, after a wonderful Easter getaway. Handstitching is fun!! I sew everything I make by hand. I don't have the patience to thread the machine. Yet, I have the patience to sew by hand...yes, that always gets people. I don't sew in public much because I'm very shy and don't like to be asked a lot of questions about what I'm doing, but I do sew, crochet, embroider, and cross stitch at work on my breaks. Me too on making felt food for my kiddos (so cute!) and I always hand stitch the binding on my quilts. I find hand sewing to be very soothing! I do sew in public. Like when I'm waiting for someone I just take out my work and start sewing. What a fabulous giveaway. I sew out in public all the time, mainly while waiting for others - in the car, in the local park, in waiting rooms, on the train. Lots of fun. I ALWAYS try to have a project to work on in public! My husband gave me a portable lap desk that I can carry in the car, or to the doctor's office, which holds all the supplies needed to continue stitching on a small project. Oh! Looks like a dandy of a book! I handstitched a quilt once and took the bits and pieces everywhere. I mostly stitched in the car, but I didn't mind taking it on ski trips or to meetings. I always have my little project bag with me and work on what ever is in the works, anything from cross stitch to stuffing and sewing my little projects. I feel lost without my project bag and don't mind working on my projects in public. Looks like a great book. I did all the embroidery on the twelve blocks of a crazy quilt while out running errands. You'd be amazed by how often you end up sitting, waiting. I have taken small projects on camping trips many times and often sit on my front stoop and do embroideries. Needles are out at the playground! I tend to sew at home but if I had this book it might inspire me to sew anywhere! I love to do hand applique and hand quilting; I'd like to try hand sewing in place of machine sewing. I did hand stitch a mini quilt years ago; the calmness of the work is very nice. I've hand appliqued in a doctor's office, at the library, at the hospital--I found that others are always interested in what I am doing. Thanks very much for this lovely giveaway. if I know I'll be at the dr's ofcr for awhile (like the gyn's ofc- why is the wait there ALWAYS so long? ), then I'll bring small projects with me! I stitch everywhere. On the streetcar, at the bar, at the library, in the park, on my balcony, in bed (terrible habit, i lose needles and scissors amongst the sheets. so far i've found all of them, and none the hard way thank goodness). I stitch before class. I stitch when it gets slow at work. I've stitched on airplanes, during movies, at restaurants waiting for my meal to arrive. In the waiting room of both my doctor and my dentist. At a concert when the band was boring, I sat at the back of the bar and cross-stitched. I've even stitched at city hall. I sew at home because I've never thought of sewing as a portable hobby. I guess I need to rethink that! I have been known to sew at work, usually cos one of the chaps has ripped his trousers and needs them mending! i usually have them make me coffee while i stitch up thier crotch! I take my cross stitch and sit by the pool while my daughter is having her swimming lesson. Thanks for the chance to have a copy of this beautiful book. I haven't done any sewing in public yet, but I do sometimes knit in public. i've haven't sewn in public, but i definitely do embroidery sitting out on my back deck. What a fabulous book!! I am a very public stitcher. I take my hand sewing everywhere! I would be lost without something to keep my hands busy and hand stitching has become my passion...:) Thanks for hosting this giveaway!